Lauri Ylönen (born 23 April 1979) is a Finnish singer-songwriter, best known as the frontman of the Finnish alternative rock band The Rasmus. 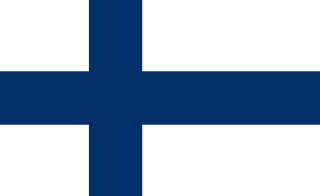 Finland, officially the Republic of Finland, is a country in Northern Europe bordering the Baltic Sea, Gulf of Bothnia, and Gulf of Finland, between Norway to the north, Sweden to the northwest, and Russia to the east. Finland is a Nordic country and is situated in the geographical region of Fennoscandia. The capital and largest city is Helsinki. Other major cities are Espoo, Vantaa, Tampere, Oulu and Turku. Alternative rock is a style of rock music that emerged from the independent music underground of the 1980s and became widely popular in the 1990s. In this instance, the word "alternative" refers to the genre's distinction from mainstream rock music. The term's original meaning was broader, referring to a generation of musicians unified by their collective debt to either the musical style or simply the independent, DIY ethos of punk rock, which in the late 1970s laid the groundwork for alternative music. At times, "alternative" has been used as a catch-all description for music from underground rock artists that receives mainstream recognition, or for any music, whether rock or not, that is seen to be descended from punk rock. When he and Heinonen started at Suutarila high school in the early 1990s, they met Pauli Rantasalmi and later Janne Heiskanen. Ylönen initiated the project of The Rasmus (then called just "Rasmus") in 1994, along with Eero Heinonen (bass) Pauli Rantasalmi (guitar), and Jarno Lahti (drums), with Lahti subsequently being replaced by Heiskanan. First, they called themselves Trashmosh, then Anttila, and at last Rasmus. They played their very first show before the winter break in school, 1994. They played songs with a style of rock and funk. Ylönen became the lead singer, composer and songwriter of the band. He quit school because the band took too much of his time. The Rasmus is a Finnish rock band that formed in 1994 in Helsinki while the band members were in upper comprehensive school. The original band members were Lauri Ylönen, Eero Heinonen (bass), Pauli Rantasalmi (guitar) and Jarno Lahti (drums). Jarno Lahti left the year after and was replaced by Janne Heiskanen in 1995. Heiskanen quit the band in 1998 and was soon replaced by Aki Hakala. The Rasmus has sold 5 million albums worldwide, 310,000 copies in their native Finland alone. They have won numerous awards, both domestic and international. The bass guitar is a plucked string instrument similar in appearance and construction to an electric guitar, except with a longer neck and scale length, and four to six strings or courses. The guitar is a fretted musical instrument that usually has six strings. It is typically played with both hands by strumming or plucking the strings with either a guitar pick or the finger(s)/fingernails of one hand, while simultaneously fretting with the fingers of the other hand. The sound of the vibrating strings is projected either acoustically, by means of the hollow chamber of the guitar, or through an electrical amplifier and a speaker. In 1998, after having released three albums, Janne Heiskanen left and in 1999 Aki Hakala became The Rasmus' new drummer. In the same year, the band's former manager Teja Kotilainen left their current record label, Warner Music Finland. The band signed to Playground Music Scandinavia soon afterwards. Warner Music Group Inc. (WMG), also known as Warner Music, is an American multinational entertainment and record label conglomerate headquartered in New York City. It is one of the "big three" recording companies and the third largest in the global music industry, after Universal Music Group (UMG) and Sony Music Entertainment (SME). Formerly part of Time Warner, the company was publicly traded on the New York Stock Exchange until May 2011, when it announced its privatization and sale to Access Industries, which was completed in July 2011. With a multibillion-dollar annual turnover, WMG employs more than 3,500 people and has operations in more than 50 countries throughout the world. Playground Music Scandinavia AB(PGM) is Scandinavias biggest independent record company and distributor founded in 1999. The company operates in Scandinavia with offices in Sweden, Denmark, Finland, Norway and with local distribution partners in Estonia, Latvia, Lithuania and Iceland. Owner of the company since 2010 is Jonas Sjöström. As a record company Playground Music does not focus on a specific genre but different genres of rock and pop has been prominent in the company catalogue. Playground Music also represent several international independent labels in Scandinavia such as Beggars Banquet, 4AD, Domino, Matador, XL Recordings, Mute, Cooking Vinyl, Secretly Canadian, City Slang, Ninja Tune, Ignition and Epitaph. In 1999, an association called Dynasty was founded. The association consists of the three Finnish bands The Rasmus, Killer, and Kwan. The purpose of Dynasty was to signify allegiance and friendship between the bands and their members. Many members have tattoos or wear the Dynasty logotype on guitar straps. The bands have often worked together musically. Lauri has the tattoo on his arm as well as Pauli, Pauli also got the dynasty logo on his guitar (ESP LTD). Dynasty is an association founded in 1999 by the Finnish bands The Rasmus, Killer and Kwan. Killer has since disbanded and are no longer considered members. Killer was a rock band founded in 1999 in Helsinki, Finland. Although Killer was a quartet, vocalist Siiri Nordin was by far the most visible member. Notable were the different music styles that influenced their tracks: Siiri grew up with jazz & blues but the influences of the band included grunge pioneers such as Pearl Jam & Nirvana (Timo), electronic music and even funk & folk. Kwan is a hip hop/pop music group from Helsinki, Finland. Most visible members of the band are the two vocalists Mariko and Tidjan. The band started as a hip hop act, but nowadays the songs contain more singing than rapping. Lauri sang co-vocals with Siiri Nordin, the singer of Killer, on a b-side version of the group's single, "All I Want". In 2004, Ylönen recorded a song together with Apocalyptica and HIM's singer Ville Valo, named "Bittersweet". The song is available on Apocalyptica's self-titled album, Apocalyptica . It has also been released as a single and music video. Apocalyptica is a Finnish symphonic metal band from Helsinki, Finland, formed in 1993. The band is composed of classically trained cellists Eicca Toppinen, Paavo Lötjönen, and Perttu Kivilaakso, drummer Mikko Sirén, and vocalist Franky Perez. Originally a Metallica classical tribute band, the band eventually adopted a neoclassical metal style without the use of conventional guitars. They have sold over four million albums to date. HIM was a Finnish gothic rock band from Helsinki, Finland. Formed in 1991 by vocalist Ville Valo and bassist Mikko "Mige" Paananen under the name His Infernal Majesty, the band broke up in 1993, before being reformed in 1995 by Valo and guitarist Mikko "Linde" Lindström. After being rejoined by Mige, as well as new additions keyboardist Antto Melasniemi and drummer Juhana "Pätkä" Rantala, the band, now called HIM, released their debut album Greatest Lovesongs Vol. 666 in 1997. In 2000, now with drummer Mika "Gas Lipstick" Karppinen and keyboardist Juska Salminen, the band released the album Razorblade Romance, which reached the number one spot in Finland, Austria and Germany. Their first single, "Join Me in Death", also charted at number one in Finland and Germany, eventually going platinum and gold respectively. Following the addition of Janne "Burton" Puurtinen on keyboards, HIM released Deep Shadows and Brilliant Highlights and Love Metal in 2001 and 2003 respectively. Both cracked the top ten in several countries, and allowed the band to tour the United Kingdom and the United States for the first time. Ville Hermanni Valo is a Finnish singer, songwriter and musician, best known as the lead vocalist of the gothic rock band HIM. Influenced by the likes of Black Sabbath and Type O Negative, Valo began his career playing bass and drums in various bands around his hometown of Helsinki. In 1991, he formed HIM, which would go on to become one of the most successful Finnish bands of all time, and the first to receive a gold record in the United States. Valo is also credited as the creator of the heartagram, the band's trademarked symbol. In 2017, HIM announced their plans to retire following a farewell tour that same year. The band played their final show on New Year's Eve 2017. A year later, he released another song with Apocalyptica, named "Life Burns!". This song was also released as a single and music video. The musical genre was much heavier than "Bittersweet." "Life Burns!" is taken from the same album as "Bittersweet" Ylönen also sang, with other members Kwan and Siiri Nordin of Killer, a song called "Chillin' at the Grotto" at a gala. Ylönen's most recent project was composing the soundtrack of the Finnish movie "Blackout". The soundtrack was released in December 2008. Most recently, Ylönen announced a solo album scheduled for release in March 2011 with the first single Heavy being out in February. The material will have its premiere at Emma Gala on February 26, 2011. Ylönen stated that he wanted several songs, that did not fit The Rasmus, to be released as a major record rather than a demo or something like that. The album will be self-produced with his record label Dynasty Recordings. In February 2011 the title of the album was revealed, New World. It was later released on 30 March 2011 in Finland, with other European countries following. The first single was called Heavy, the video was shot by Owe Lingvall who had previously directed the singles Justify and October & April for The Rasmus. In May 2011 Lauri stated that In The City" would be the second single from his debut album. The video was shot in Las Vegas. Throughout the summer Lauri toured the Finnish summer festivals and even a few European countries, his next stop was Germany in September 2011. In late September it was revealed that a remixed version of What Are You Waiting For would be his next single. Ylönen announced via his official website that he would continue his European tour starting with two dates in Russia for 2012. Recently he was nominated for best Finnish Act for the MTV EMA'S 2011. He subsequently won this category and went on to be nominated in the Best Worldwide Act. Ylönen is currently in a domestic partnership with a Finnish model Katriina Mikkola. The couple has one child together, a son born named Oliver in December 2017. The family resides in Los Angeles. Playboys is the second studio album by Finnish rock band The Rasmus which was released on 29 August 1997 on Warner Music Finland. Hell of a Tester is the third studio album by The Rasmus, then called Rasmus. It was released in 1998 by Warner Music and received Gold status in Finland. The most popular single was Liquid, which was released in September, getting into the Top 40 on MTV Nordic. It was voted Single of the Year for 1998 by music critics and fans and the video won an award in 1999 at the Finnish Music Video Awards. Hide from the Sun is the sixth studio album by the Finnish rock band The Rasmus. It was originally released in mainland Europe, the United Kingdom, Scandinavia and Japan on 12 September 2005. It was later released in the United States on 10 October 2006, and featured a selection of B-side remixes and special edition bonus tracks. The US edition also included the previously unseen video for "Immortal". The name "Hide from the Sun" is a quotation from the song "Dead Promises". The album cover was painted by guitarist Pauli Rantasalmi. Into (Enthusiasm) is the fourth studio album by the Finnish rock band The Rasmus, and the first studio album to be released under the name "The Rasmus". It was originally released on October 29, 2001 by Playground Music. Hell of a Collection is the first compilation album by the Finnish band The Rasmus, released in 2001 by Warner Music Finland. 1st is the first EP by the Finnish rock band The Rasmus. It was originally released independently through Teja G. Records in late 1995, but after some months the band signed with Warner Music Finland and released the EP through there instead. 2nd is an EP released by the Finnish rock band The Rasmus in 1996. It was originally released by the record label Warner Music Finland. "Liquid" is a power ballad by the Finnish rock band The Rasmus, originally released on the band's third album Hell of a Tester on 2 November 1998. "Swimming with the Kids" is a song by the Finnish rock band The Rasmus, originally released on the band's third album Hell of a Tester on 2 November 1998. "Keep Your Heart Broken" is a song by the Finnish alternative rock band The Rasmus, and the ninth track of their 2005 album Hide from the Sun. It was written by lead-singer Lauri Ylönen. Paula Julia Vesala is a Finnish singer-songwriter, actress, and playwright. She was one of two singers and main lyricist in the pop rock duo PMMP along with Mira Luoti. Her solo career began in 2015 under the stage name "Vesala". She has composed songs for other well-known Finnish artists such as Vesa-Matti Loiri, Jenni Vartiainen, and Antti Tuisku. "Ghost of Love" is a radio single released exclusively in Finland by Finnish alternative rock band The Rasmus, and the third track on their 2008 studio album Black Roses. It was written by lead-singer Lauri Ylönen. Best of The Rasmus 2001–2009, also referred to as Best of.. 2001-2009 is a compilation album by the Finnish alternative rock band The Rasmus, it was released on November 2, 2009. The album contains the best songs between 2001 and 2009. While most of the songs were already released, it features a new unreleased song called "October & April" which features vocals by Anette Olzon from Nightwish. This song was recorded during the same time as the other songs from the band's latest studio album Black Roses, but wasn't included as it didn't follow the album concept. New World is the first solo album from Lauri Ylönen, lead singer of Finnish band The Rasmus. The album was released on 30 March 2011. This album contains songs by Lauri that didn't fit The Rasmus' style, and decided to be released as a solo album. The first single released was "Heavy" and the second was "In the City". The Rasmus is the eighth, self-titled studio album by the Finnish rock band The Rasmus, which was released in Finland on 18 April 2012. Dark Matters is the ninth album by the Finnish rock band The Rasmus, which was released in Finland on 8 October 2017. It is their first album after five years of inactivity, as a continuation of their previous album The Rasmus (2012). "Ice" is a song by the Finnish rock band The Rasmus, originally included on the band's second album Playboys. The EP-single was also released in 1998 by the record label Warner Music Finland. It is the fourth single from the album Playboys, and features the B-side song, "Ufolaulu". ↑ "Emma-gaala kasvaa juhlavuoen kunniaksi jättitapahtumaksi". Mesta.net. Archived from the original on 2011-07-19. Retrieved 2010-11-15. ↑ "The Rasmuksen Lauri Ylönen julkaisee sooloalbumin". Voice.fi. Retrieved 2010-11-15. ↑ "Lauri will release solo album". therasmus-hellofasite.com. Archived from the original on 2010-12-03. Retrieved 2010-11-15. ↑ Katri Utula. "Linnan juhlat". Ilta-Sanomat . ↑ Pauliina Leinonen. "Lehti: PMMP-Paula ja Rasmus-Lauri saivat pojan". Ilta-Sanomat. ↑ "Paula Vesala ja Lauri Ylönen: Avioehto". mtv.fi. ↑ Mika Seppänen. "Paula Vesala ja Lauri Ylönen solmivat avioehdon – naimisiin marraskuussa". Ilta-Sanomat. ↑ "Paula Vesala ja Lauri Ylönen – uraparin avioliitto". ↑ Outi Pippuri. "Gloria: Tällaista on Paula Vesalan arki Los Angelesissa". Gloria. ↑ Visa Högmander. "Paula Vesala elämästä Los Angelesissa: Se ei ole mikään paratiisi". MTV. ↑ Visa Högmander. "Los Angelesiin asettunut Lauri Ylönen: Olen panostanut perheeseen". MTV. ↑ YLE. "IL: Paula Vesala ja Lauri Ylönen eroavat". YLE . ↑ Iltalehti. "IL: Lauri Ylönen on saanut lapsen: "Se on poika"". Iltalehti . "Livin' in a World Without You"